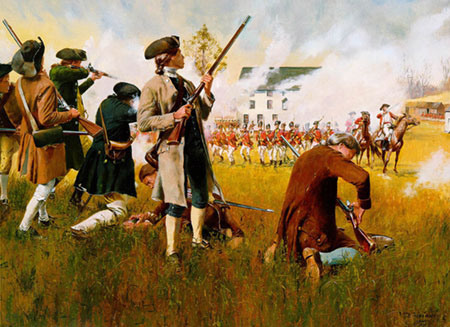 The Second Amendment recognizes that evil exists by giving free people the best weapon to fight back. Sometimes, tho’, life is such that evil still wins. 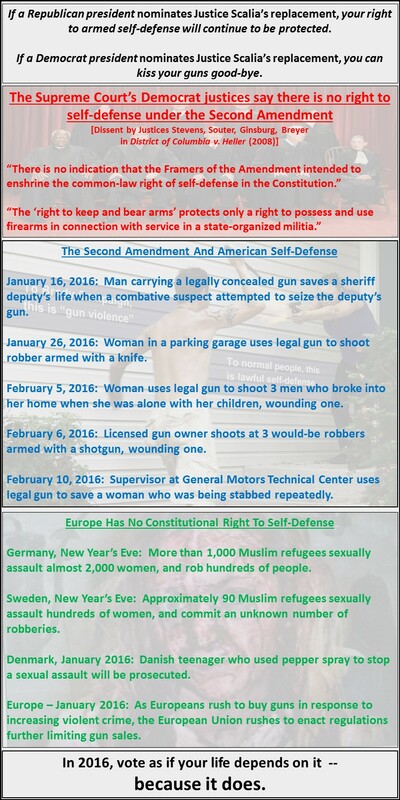 Now that the Progressives have gotten into their groove attacking the Second Amendment, there is a lot of material defending the Second Amendment and exposing just how bad (and tyrannical) Progressive arguments are. I’ve also included a few other topical and just plain funny posters. Warning! Warning! Warning! Okay, two warnings really. The first warning is that Hillary is out to get your guns. The second warning is that I’m going to use this post to shill my collection of essays, Our Second Amendment Rights In Ten Essays . I consider the second item something of an antidote to the first. Clinton believes Heller was wrongly decided in that cities and states should have the power to craft common sense laws to keep their residents safe, like safe storage laws to prevent toddlers from accessing guns. In overturning Washington D.C.’s safe storage law, Clinton worries that Heller may open the door to overturning thoughtful, common sense safety measures in the future. You know, Australia’s a good example, Canada’s a good example, the UK’s a good example. Why? Because each of them had mass killings, Australia had a huge mass killing about 20 or 25 years ago. Canada did as well, so did the UK. In reaction, they passed much stricter gun laws. In the Australian example, as I recall, that was a buyback program. The Australian government as part of trying to clamp down on the availability of … weapons offered a good price for buying hundreds of thousands of guns and basically clamped down going forward, in terms of having more of a background check approach, more of a permitting approach. But they believed, and I think the evidence supports them, that by offering to buy back those guns, they were able to, you know, curtail the supply and set a different standard for gun purchases in the future. When it comes to guns in America, should voters buy what Hillary is selling? Is Heller wrong and did the Founders intend that the Second Amendment not apply to cities and states? Do strict gun control laws in other countries work to reduce violent crime and mass murder? And is Hillary properly identifying the real threat to American lives or will her plans create a bigger threat to us than any individual mass murderer could? With the Second Amendment taking pride of place in this year’s election, I’ve consolidated these well-honed arguments into ten easy-to-read essays and published them in a very short (63 page) ebook, Our Second Amendment Rights In Ten Essays . If you act before Friday, May 27, you can get the book for free. After that, it’s only 99 cents. Given the price — free — you’ve got nothing to lose by downloading the book and giving it a try. If you like it, I ask only two things: (1) please recommend or loan the book to your friends, and (2) please stop by its Amazon page to give it some stars and a nice review.